Billie Eilish is a teenager. Like Lorde before her, she does not hide nor run from this fact. The Los Angeles ready-made-superstar deals in unabashed iconoclasm. From her goading looks and subversive disinterested postures to her hyper-stylized music videos and infinitely quotable, half-laughed, half-arsed interviews; Eilish has no interest in adult approval. Maturity is not the point, the moment is king: it exists to be mastered and manipulated, dismissed and deciphered with a bratty sneer and an inelegant eye roll. Eilish is the kind of star who practically begs the whole world to hate her, but who, naturally enough, ends up utterly adored. The question, of course, is not: will WHEN WE ALL FALL ASLEEP… be a hit? The albums runaway success is ensured by a legion of devotees who are content to whittle away their lives posting (and re-posting) every unfocused, half-glimpsed snapshot of Eilish on Instagram with charming captions like: “I’d let her kill me”. No, the more pertinent issue at hand is whether Eilish can transform her love of artifice and façade into rich and rewarding songcraft. They might not sound like contradictory impulses, but they so often are. The drive toward radical disobedience as well as the arch contortion of aesthetic and sound so often destroy the space usually reserved for sincerity. Lorde was more than equal to the task: she had the cool disdain and detachment of a dropout, while also capturing the thrills of small town, backwoods, youth in rebellion. She was know it all with ambition, a naïve servant who hadn’t stepped on her first plane, but who was destined to travel the globe and confront the false ideals of bling with her own seething normcore honesty. Eilish is incapable of repeating this trick. Firstly, because she was practically born a superstar: success found her, she needs no escape and she’s certainly not a drop out. Furthermore, her music thrives on a romantic subversion, not in search of some deeper more earthy truth, but something more glamorous, idolatrous and devious. Whatever Eilish does, it cannot be framed in relation to any kind of normalcy, that would be dismissed out of hand, instead WHEN WE ALL FALL ASLEEP… has to be melodramatic and brazenly bipolar. Some will be rightly infuriated by Eilish applying suicidal impulses like an Instagram filter, but that is part of the teenage experience: groping for the gravest of possibly terms for what is likely a fleeting low. Eilish captures these extremes masterfully, by transitioning from the playful “my strange addiction” and the hyper stylized zombie march of “bury a friend” into the album’s depressing, insular ending suite of “ilomilo”, “Listen Before I Go”, “I Love You” and Goodbye”. By the album’s end you’ll no doubt be throwing up your hands and asking: how on earth did we end up here? After all, the record starts with a series of absolutely delicious postures. “bad guy” pairs a hypnotic bass groove with a splattering of impeccable placed handclaps to transfix the listener as the beat insidiously commandeers your hips. The lyrics offer a brattily brilliant sexual dissection. Obnoxiously obvious in the extreme, but delivered with a delectable deadpan that peaks with a truly farcical chorus: “I’m the bad guy, duuuuuh”. Dripping with disdain, exuding attitude, undeniably disingenuous, it’s an absolute trip. “xanny” is perhaps better still. Turning the destructive aftermath of a LA ragger into a scene from a trip-hop opera, Eilish simultaneously deifies (“their pretty heads are hurting”) and dismisses (“don’t give me a xanny, now or ever”) her peers. She is the composed one, in possession of a level head who refuses to indulge and yet she sees the comical beauty in the chaos that surrounds her. It’s not all a bed of roses for Eilish. She does inevitable run into the trap of trying far too hard to stylize and subvert every syllable of this record. “you should see me in a crown” is painfully transparent in its iconic ambitions. Its stark tonal shift leading to the chorus and phase shifting bass will go down a storm live, but it proves impossible to avoid rolling your eyes when confronted with such blatant posturing and forced rhymes (“Blood on a marble wall, I like the way they all, scream…Sleeping inside a hearse, I don’t dream”). It’s a comical try hard moment. Mercifully, while Eilish does tip toe up to this unintentionally cringeworthy line, she rarely crosses it so fragrantly again. In fact, Eilish is far more likely to stumble upon something resembling profundity than she is anything embarrassing. “wish you were gay” might have a media baiting title, but it’s actually a sweet and masterfully constructed anti-love song that recalls Lily Allen at the absolute peak of her powers. Atop a dreamy submerged waltz of beat, Eilish details an obsessive longing for a man so toxic to her psyche that she secretly wishes he were gay to preserve her own fragile dignity (“Is there a 12 step just for you?). His cold disinterest isn’t enough; she needs a bigger more impenetrable barrier between her and the subject of her lust (“to spare my pride/To give you lack of interest an explanation/Don’t say I’m not your type/Just say I’m not your preferred sexual orientation/I’m so selfish”). Those expecting Eilish to be a flash in the pan will be confounded by her remarkably adept turn of phrase. Even on tracks so wishy-washy and slight that they threaten to underwhelm and succumb to sorrowful vibing, she has a habit of pulling out a singular lyric, divine in its honesty, that ties the whole affair together (“Quiet on my own, when I’m coming home/I could lie tell you, I like it like this”). Elsewhere, on “8”, the opposite is true: a charming guard-down lyric sheet is somewhat ruined by a high pitched and cloying vocal effect designed to replicate Billie’s childhood voice. Luckily these failing a few and far between and never threaten to derail an engaging and thoroughly enjoyable project. Make no mistake: Billie Eilish has arrived. WHEN WE ALL FALL ASLEEP… is too thoughtful, too well crafted and, frankly, too much fun to be denied or dismissed. And yet, for all its qualities, Eilish is far from fully formed. There a gaping holes in her sound, impulses yet to be reconciled and a profound potential lurking ever so slightly out of sight. Her future no doubt lies between the empty, but irresistible attitude of “all good girls go to hell” (the epitome of an enjoyable, but empty posture) and “ilomilo” (a delicate, mournful and yet playful confessional that lacks a little oofmph). When Lorde, that other great teenage superstar, unleashed Pure Heroine it was almost too perfect: an immaculate blend of disenfranchised posture and strong willed poignancy. It seemingly boxed the artist in, leaving her nowhere to turn, trapped by her own rhetorical and innate completeness (she would deftly escape this dilemma on her second album). Eilish finds herself in almost the exact opposite situation. Her control of aesthetic, tone and mood is equally masterful, but the threads of her song and intricacies of her song writing have yet to be resolved. This project stands thrillingly incomplete. This formula could be refined, perfected and, in future, made whole – or Eilish could simply kick it to the curb, chase trends and evolve in an as yet unforeseen direction (as is the want of youth). Therein lies the joy of both adolescence and WHEN WE ALL FALL ASLEEP… It is a strangely coherent flirtation with aesthetic perfection that never quite stumbles upon artistic resolution. From the eye-rolling girl who deadpans “duh” at the outset to the straight-faced romantic who’s found reworking Leonard Cohen’s “Hallelujah” on “I love you”, every syllable of this LP is undeniably Eilish, but who or what she actual is remains to be seen. For the time being, she’s sumptuously insincere in her admittedly selfish over-sharing attempt at honest. Perfectly posed, oozing with attitude and boasting a host of brilliant neo-gohtic beats, Gen Z's principle starlet has more than delivered on her debut album. 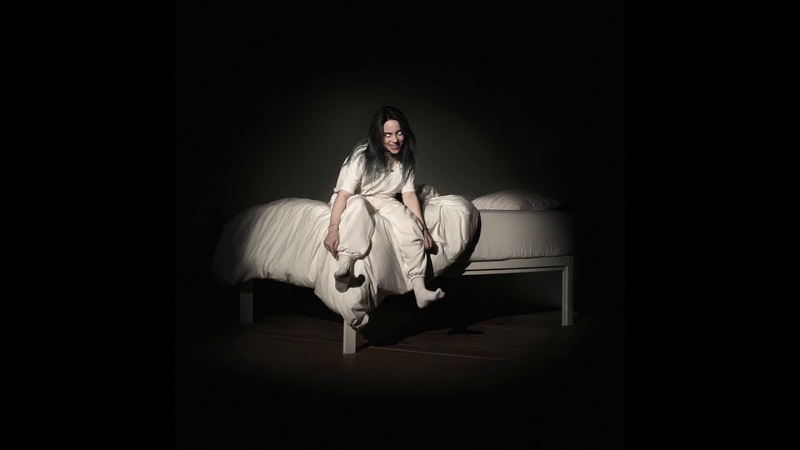 WHEN WE ALL FALL ASLEEP... is far from complete - many of its sonic and lyrical threads have yet to be resolved and Eilish is occasionally overwhelmed by posture - but more often than not this debut feels strangely profound and infinitely danceable. Despite possessing a sharp eye and a crafty turn of phrase, Eilish remains undeniably teenage as she lurches between melodramatic extremes, but - truth be told - she's all the better for it.